Naturally most LEGO exosuits we see have a more or less humanoid appearance, but occasionally builders will craft them from a more beastly perspective. 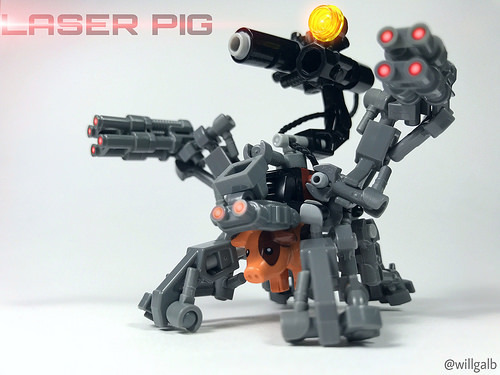 Will Galb does just that with his Laser Pig, which is sure to leave bacon lovers with a terrifying vision of the future. Will has turned the usually adorable pig into a laser-equipped death machine. With enough weaponry to level a city block, you could be forgiven for running in fear from this powered-up porcine. After all, he looks like a twisted, futuristic take on Napoleon from Animal Farm. But, as the builder describes it, Laser Pig was in fact designed as humanity’s last hope in a dystopian world ruled by alien overlords. In a time when humans fail, our farm animals may just become our saviors – especially if we outfit them with lasers and exo-armor. Something to think about next time you’re eating a ham sandwich.